Why did the beautiful CIA operative seduce the handsome yet ruthless former KGB agent in Chapter Four? And why didn't the mysterious clairvoyant use her psychic powers to pinpoint the serial killer's location? Questions arise when you're reading a book. Many readers--if the author were near--would likely seek additional clarification on key plot points or characters. And non-fiction readers might pepper the writer with questions pertaining to the book's thesis, or to correct a factual error. A new Kindle feature makes this reader-author interaction a lot easier. Called @author, it allows readers to ask questions while reading a Kindle book, or from an Amazon Author Page. Say you're reading a Kindle book and want to question the author about a particular passage. Using the 5-way controller, you highlight the passage and type “@author,” followed by your question. Next, you select "save & share" from the options at the bottom of the note window. Amazon will tweet your question to the author, and post it on his or her Amazon Author Page. Brevity is essential, however, as questions from the Kindle are limited to just 100 characters. For longer inquiries, go to the writer's Author Page. The @author program is in beta release, and a few well-known writers are participating, including Susan Orlean (The Orchid Thief) and Robert Kiyosaki (Rich Dad, Poor Dad). 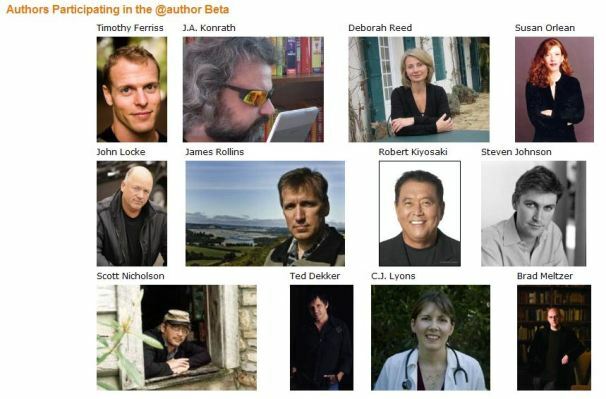 Amazon has a list of participating authors here. Sorry, you can't query dead authors--not yet, anyway.